Did you have a great holiday period? Even good? Did you eat some good food? Great food? Of course I did! But I hope everyone enjoyed everything, even if you’re groaning about it now. It was delicious, but we move on to better eating and exercise, at least for a while. The big holiday is over, and now everyone is trying to figure out how the heck to get back into their clothes that are suddenly tight. Well, you’ve got options: yoga, walking/running, weight training, Pilates, take your pick. I made five trips to the Salvation Army on NASA Road 1, the last one being today. After the third trip, just for fun, I did a bit of shopping and found a fabulous pair of knee-high boots with heels on them that actually FIT. My calves are large from years of walking and driving a 5-speed manual transmission, so most knee-high boots don’t fit me, much less with jeans on. They were not expensive, either, and look like they were never worn. The no-slip rubber soles make them safe. A dose of shoe polish made them look fantastic. 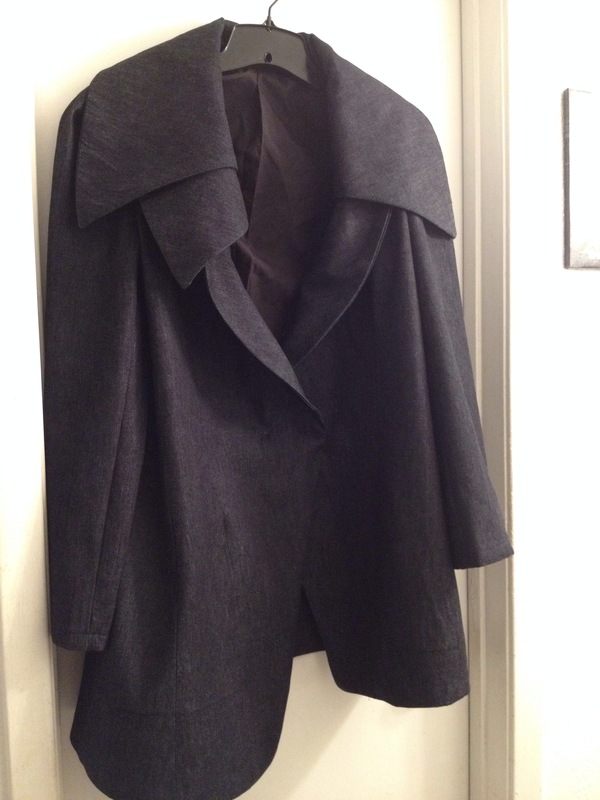 I’m going to town tomorrow, and I think I’ll wear them with that new Guy Larouche jacket I finally finished New Year’s Eve. Yes, it’s supposed to look like that. Check out the pattern if you don’t believe me. I also went to Half Price Books twice, returned an old cell phone to Verizon for recycling, and put out several extra bags of trash, including two huge bags of shredding. I can’t believe I still had old stuff that should have been discarded and/or shredded a long time ago, but I keep finding stuff to get rid of. Friend of the blog ND has also been going through boxes that she hasn’t looked through in years. She said it was the track of her life, then realized that if she didn’t make it home one day, her family would find all that stuff. I reminded her that if there’s anything she doesn’t want anyone to find, now is the time to get rid of it–while she still can! So now the whole HeatCageKitchen headquarters is neat and organized for 2015. Soon I’ll be working in the garden, which, surprisingly, is now free of weeds since my August experiment with non-toxic weed killer. I just noticed it the other day–a little grass, but NO WEEDS. Hot DAWG!! 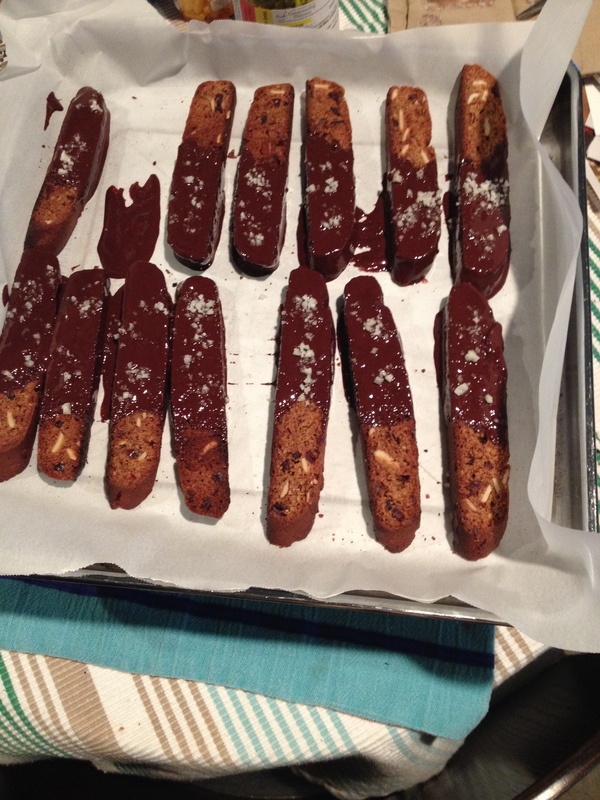 I have a confession: I did indeed make the biscotti I blogged about right before Christmas. I got up Christmas morning and made them first, carefully dipping them into the chocolate and carefully sprinkling on some French grey sea salt just like in the picture. Guess what? They were AWFUL! No joke–they were OK before the chocolate dip, but once I finished them off, yuck. They just did NOT entertain my palette. So, my apologies. I had planned to give some to Neighbor K, but that idea tanked quick. I ate them, but mostly to get rid of them. K says they are awful because they are gluten free. Oh, well. 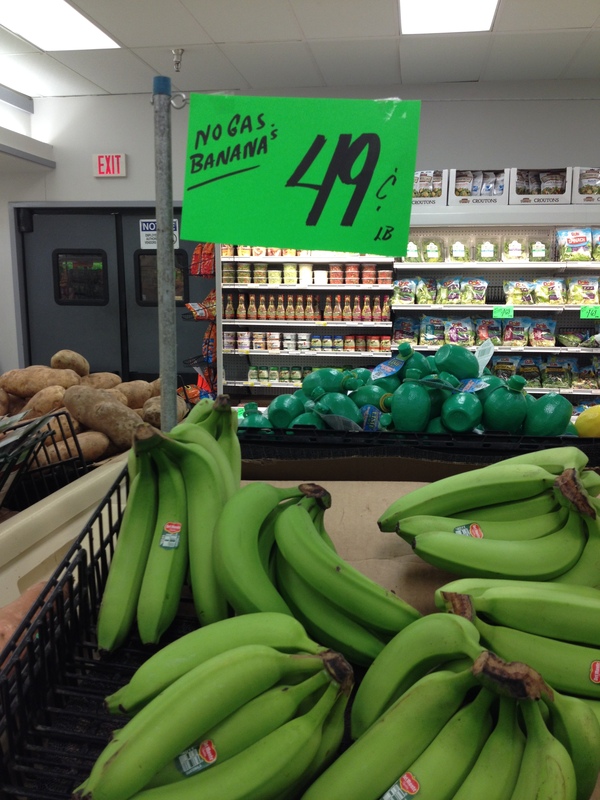 Please explain to me how bananas are “no gas.” Bananas are high in starch/sugar, which is the best way to get gas. A bit like “cancer cures smoking,” isn’t it? But I’m sure a number of folks believed that one, considering what store it was in. 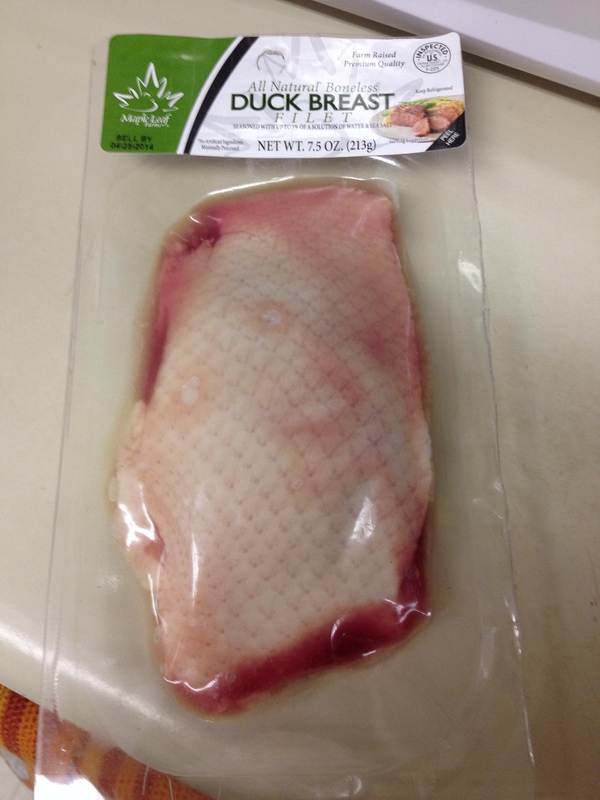 Yes, from American raised duckies. 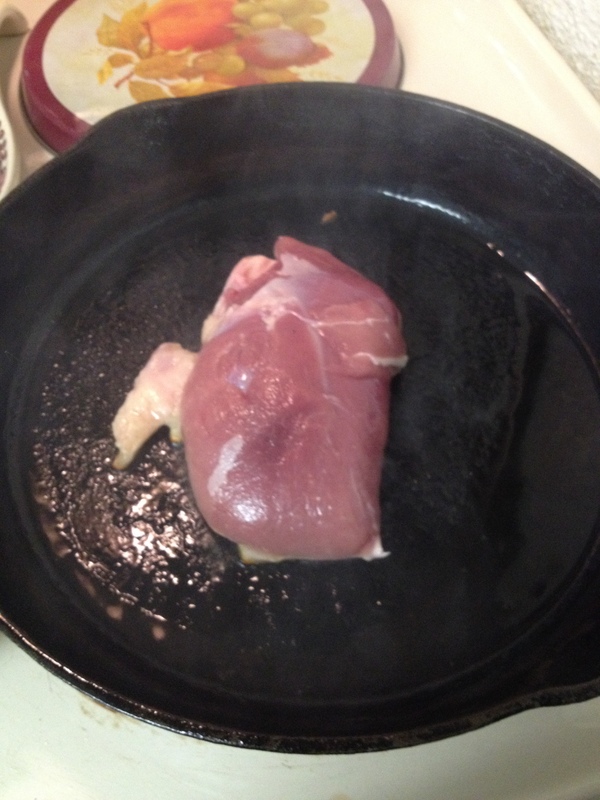 It’s about the size of a chicken breast, really. Now it gets interesting, doesn’t it? 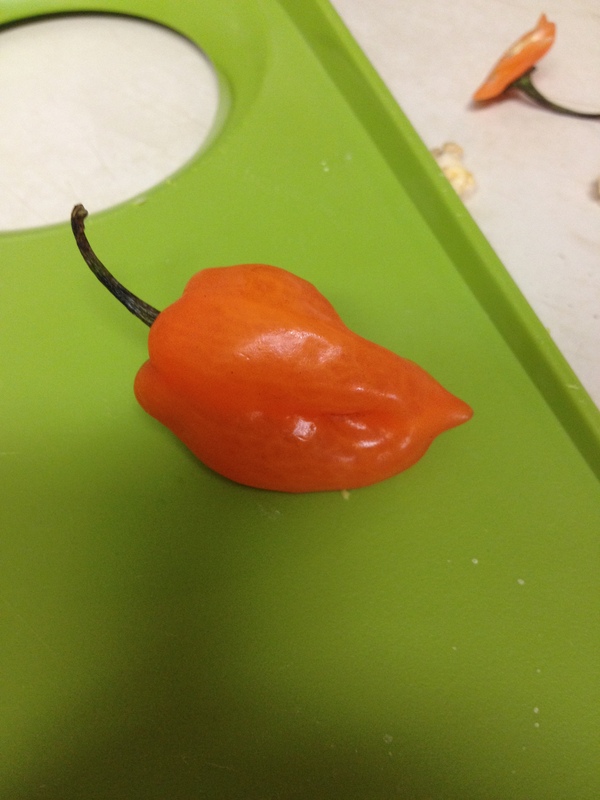 The infamous Scotch bonnet, which is one of the hottest peppers available. 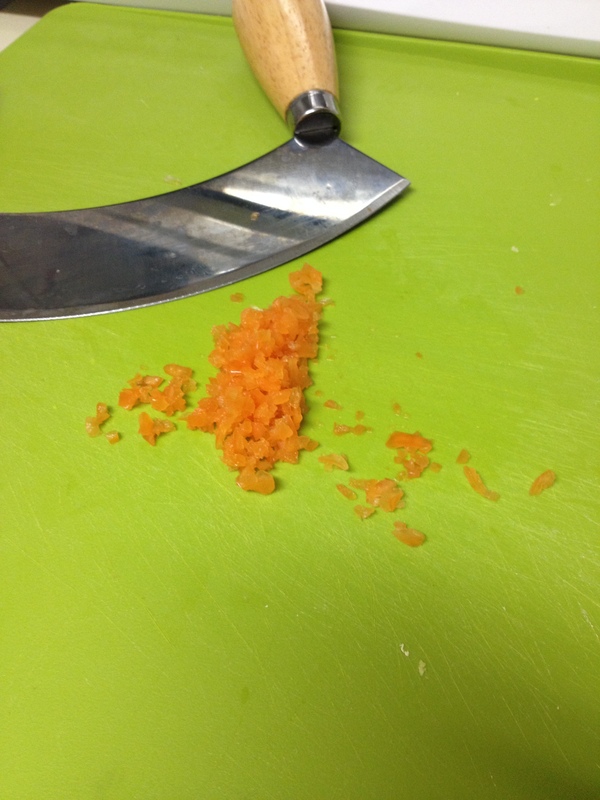 Here’s a tip: after handling hot peppers, don’t touch your eyes for any reason. If you do. . .get an eyedropper with milk, and use it. No kidding. If you’re not alone, get help–an eyedropper full of any kind of dairy milk, and drop it in your affected eyes. How do I know this? I had to look it up on a mobile device while my eyes were burning. I did it once with contacts in my eyes, too–and saved the contacts, thank heavens. 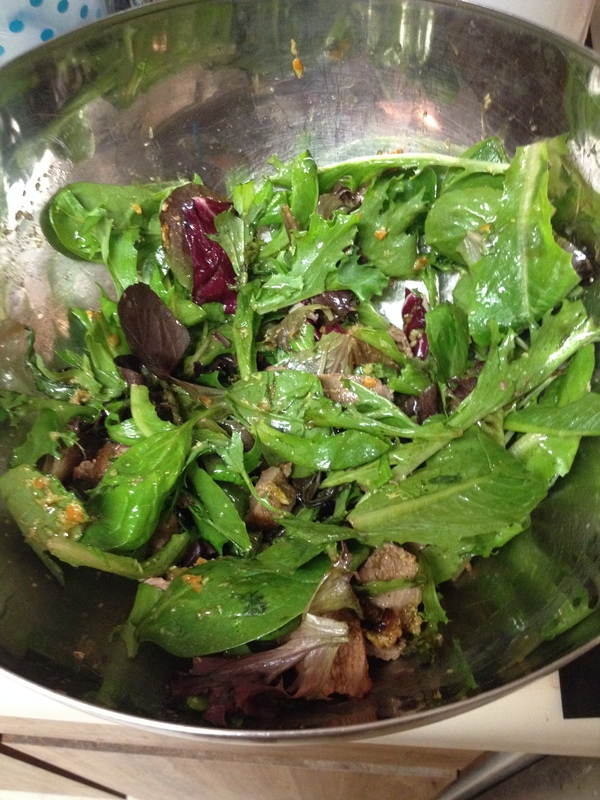 The pepper is well chopped, so it’s distributed into the citrus-based dressing. I actually bought some Thai fish sauce just for this recipe; it’s not expensive, and I found it in HEB so I didn’t have to go to Hong Kong Market. Woo hoo! Duck is not like chicken. Blander, with a slightly gamey taste. 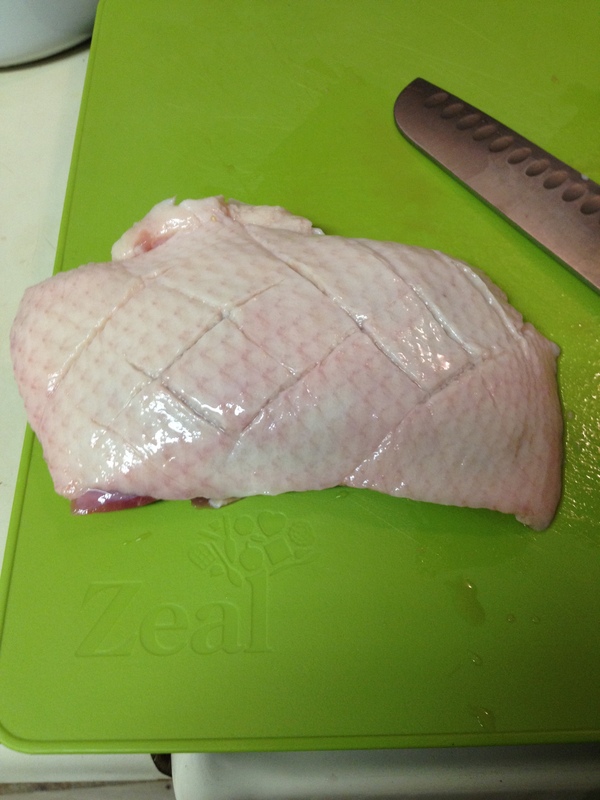 I’ve long wanted to cook duck for Christmas, and a whole one was a bit on the high side for me. No matter, I’ll do it one day–just not in a Suzy Homemaker oven. No, I didn’t get any more Suzy Homemaker appliances, but I look at them every day. I bid on an absolutely pristine Super Grill last weekend but didn’t win it. RATS! Sold for $20 plus shipping. Next time. . . . So what was for Christmas dinner? I don’t have the fancy $130 per stem wine glasses Martha Stewart used for the photo shoot. Mine are $9.50 a dozen from IKEA. But no matter, they worked just as well. I did offer Neighbor K one, and she accepted. She ate it a day or so later, and texted me that it was “excellente, chica!” Something like that. In other words, she loved it. Me too. Neighbor R was gone for a week, so I sorta finished them off before she got back. YUMMMmm. . . . I did talk to my sainted aunt a day or so after Christmas, and tried to describe this to her over the phone. She has no computer, so emailing a picture is not an option. She said, “well, I have some sugar-free Jello I can make!” No. . . as I’ve said before, I don’t *DO* Jello. But Auntie doesn’t read this blog, either. Oh, and dinner was also roast chicken, but not just any chicken. But you’ll have to wait for the next blog to hear all about the Cafe Gelatin and the roast chicken. 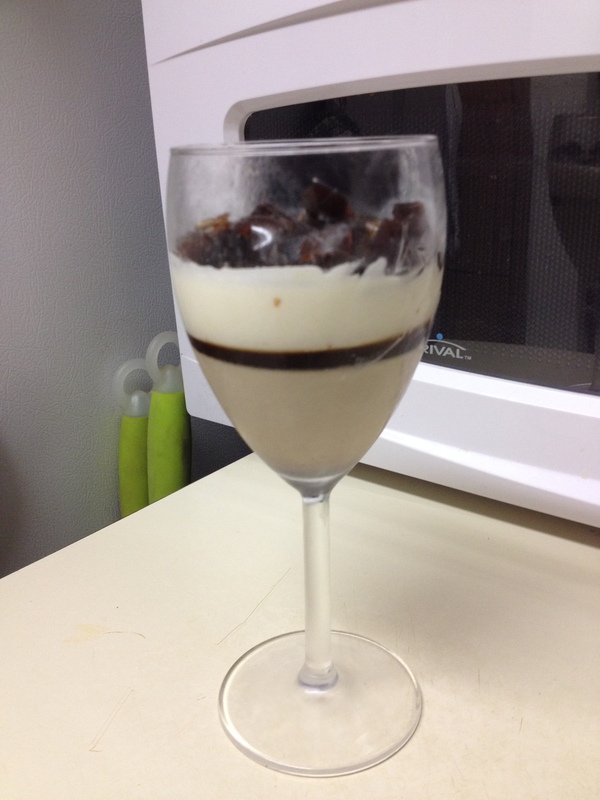 Posted by Amy on January 5, 2015 in Considered opinions, Desserts, Gluten Free, Holidays, Ingredients, Low Carb, Sugar-free, What's for Dinner?